The ninth of November marked the twenty-fourth anniversary of the fall of the Berlin Wall, probably the most important historical event since World War II and the most important lesson about human freedom experienced within the living memory of most of us. Presumably, next year there will be more of a commemoration, but the salient question now is how this lesson is being taught in the nation’s classrooms. For while those of us in our forties and older remember the fall of communism and its causes, today’s teenagers are wholly in the dark. What, then, are the high-school students of today being taught about what exactly—what principles, what forces, which people—brought down the Wall? It is actually fairly easy to answer this question since forty-five states are now controlled by the testing and curricular regime known as the Common Core. The Common Core documents themselves, admittedly, are sometimes what Churchill called the Soviet Union, “a riddle wrapped in a mystery, inside an enigma.” If we just take a quick glance at Appendix B of the Common Core English Standards, which recommends “exemplar texts” for reading, we find the addresses of a host of worthy historical figures: Patrick Henry, George Washington, Abraham Lincoln, Franklin Roosevelt, Martin Luther King, and, yes, Ronald Reagan. What a model of non-partisan selection! But it would behoove us to look at which speech of Reagan is being recommended: “Address to Students at Moscow State University.” Now that is rather odd. Would that speech be the first that comes to mind when we consider “the best of Reagan”? Was that address the most historically significant? Why not the First Inaugural or his acceptance speech at the 1980 Convention or his important addresses on foreign policy or even his 1964 “A Time for Choosing” on behalf of Barry Goldwater that launched him to political prominence? 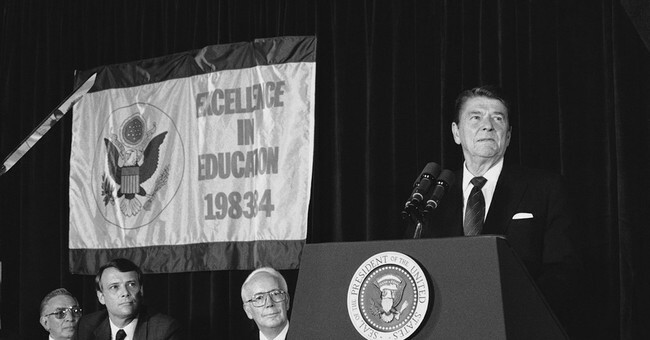 Might this be a case of the architects of the Common Core wanting to look non-partisan by having Reagan’s name on the list while actually trying to take away the force of his message to America? We can solve the mystery by finding out what will take place in classes across the land, neatly packaged for us in a textbook that bears the Common Core logo: two C’s inside a bright red ball. So there you have it. Gorbachev brought down the Wall. Why? Well, evidently because he was a good guy. In one line of the editorial we are treated to a masterful use of elliptical prose: “As political pressures began to build in the late 1980s, Mr. Gorbachev was left with two options.” Etc. What political pressures? Who or what brought those pressures? We are not told. The New York Times editors assign the words “enlightened,” “idealism,” and “pragmatic” to Gorbachev. Indeed, the General Secretary of the Communist Party is said to have had “a wisdom and decency that is sadly rare in international power politics.” Does that comment extend to American participants in international power politics, particularly at that time? Led by Mikhail Gorbachev, the Soviets were blazing through the greatest changes they had seen since the 1917 revolution. Although reforms were rapidly taking root, they were not far enough from communist ideology for Reagan. . . . In this excerpt, notice how Reagan restrains his strongly anti-communist sentiments while still extolling the ideals he represents. The lesson? The enlightened, idealistic, wise, decent, and yet pragmatic Gorbachev had events well under control. The Soviets were “blazing through changes”; i.e. reform must have been their idea. But things were not moving fast enough for the strongly-anti-communist (i.e. stubborn, right-wing) Reagan. Nonetheless, we, the editors, have found a rare speech in which he actually moderated his tone. That’s Reagan at his best, insofar as he had a best. What’s missing in this account? “General Secretary Gorbachev, if you seek peace, if you seek prosperity for the Soviet Union and Eastern Europe, if you seek liberalization: Come here to this gate! Mr. Gorbachev, open this gate! Mr. Gorbachev, tear down this wall!” Those are the words that brought down the Wall. But they are not to be found in the Common Core and therefore in the classrooms of America. The architects of the Common Core plainly do not want the young people of America to read or to watch—for it is on the Web—that speech. The progressive bureaucrats who are now in control of the nation’s schools do not want the young people of America to know that the Cold War was won on principle, that courage and resolution on the part of Americans were essential to the ending of tyranny in the communist-controlled countries and the protecting of freedom in the rest of the world. They certainly do not want young Americans thinking that we were in the right and had to be prepared to use force against an evil empire. Above all, the arch-testers do not want today’s youth and tomorrow’s voters to know that in this contest for right and freedom a former actor named Ronald Reagan played the starring role.